Remember we told you China’s stock-market rescuers needed rescuing? Now it looks as if the nation’s bad banks could use a bad bank. The four state-owned managers of troubled debt are in a bind, none more than China Huarong Asset Management Co., whose ex-chairman has just been accused of taking about $240 million in bribes, squandering state assets and maintaining a string of (presumably expensive) sexual relationships. The travails of Lai Xiaomin are the latest and most visible example of trouble at the four – China Cinda Asset Management Co., China Orient Asset Management Corp. and China Great Wall Asset Management Corp., as well as Huarong. Under government pressure to return to their core business of resolving soured loans, they’re certain to shrink. The four managers were set up in 1999 to rescue a floundering system by buying state banks’ nonperforming debt. The bad banks were then supposed to face a natural death. Instead, they turned into financial conglomerates, picking up brokerage and real estate operations and even lending for takeovers. It didn’t help that Huarong, as my colleague Shuli Ren wrote, began using its quasi-sovereign credit status to issue cheap dollar debt, pouring the funds into high-yield bonds. Huarong’s biggest mistake was to lend to acquirers shunned by state banks just as Beijing was cracking down on capital flight last year. Among the beneficiaries of the bad bank’s largess were CEFC China Energy Co., which tried to take a large stake in Rosneft Oil Co. shortly before the Chinese company’s chairman was detained, and the binge-buying conglomerate HNA Group Co. Impairments came home to roost this year, when Huarong recorded a 95 percent drop in net profit for the first half. Cinda has been less inclined to take risks, as reflected in a 0.8 percent drop in first-half earnings. Its shadow-banking exposure has been smaller, too: Just 7 percent of total assets were classified as “non-standardized credit” at the end of 2017, compared with almost 30 percent for Huarong, according to a Deutsche Bank Research note in July. But even Cinda got into the lending game, funding a $250 million takeover last year of Southampton Football Club through a bank in Hong Kong it had purchased a couple of years earlier. Investors should now expect shrinkage, and a return home for those managers that expanded overseas, especially in Hong Kong. Presenting first-half earnings, Cinda cited a “laser focus” on its core business. The shift is already evident: Distressed-asset management accounted for 63 percent of pretax profit in the six-month period, against almost 45 percent a year earlier. Huarong began cutting staff in Hong Kong in July, and all four firms have been forced by Beijing to cull employees and halt some operations at their investment banks in the city, according to the Financial Times. Adding to the pressure, the firms’ capital buffers are thinning: Cinda’s core tier-one capital ratio, at 9.67 percent in June, is down from 11.87 percent at the end of December 2016. 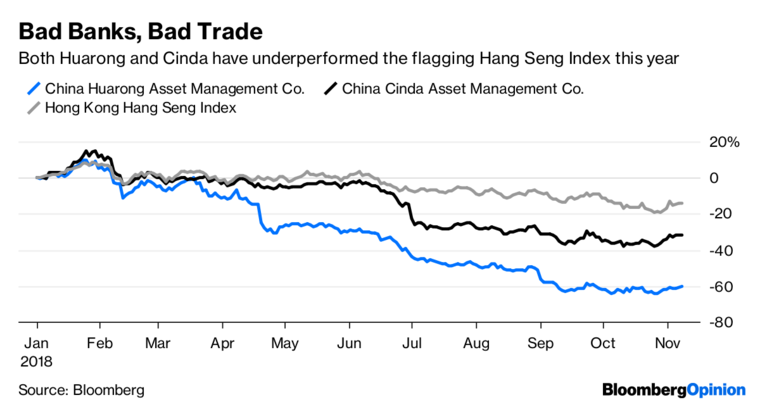 The prospects for raising funds from investors are poor, as both Cinda and Huarong are trading below book value, the unofficial benchmark for any stock sale. 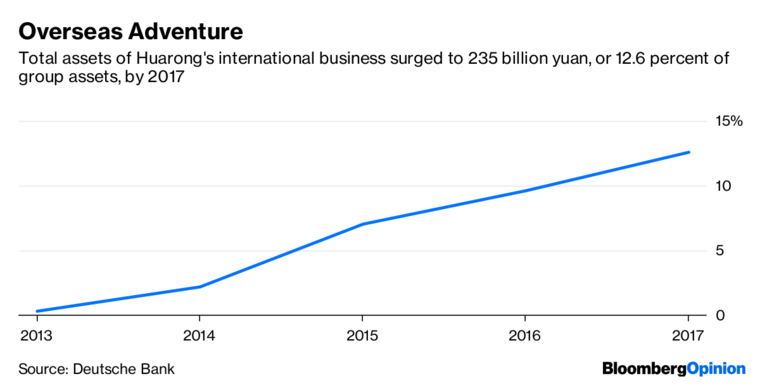 The IPO door is closing, too: Huarong scrapped plans for a China listing, while China Great Wall’s mooted Hong Kong IPO is nowhere in sight. On top of all this, the four are still called on to do national service. First it was failing banks; now they may have to rescue China’s slumping peer-to-peer lenders. There’s more pain to come.